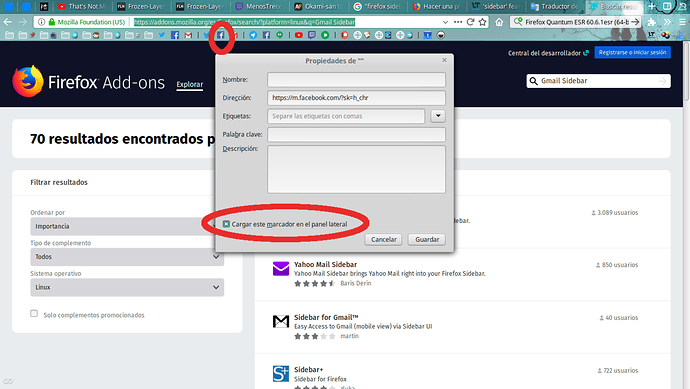 I usually use the mobile versions of different websites at the Firefox sidebar, for example Twitter, Facebook, Telegram, WhatsApp. It’s very useful to check them and chat while you are watching a website. But when I’m often chatting with English and Spanish people, I need to change the spell-checker dictionary every time. 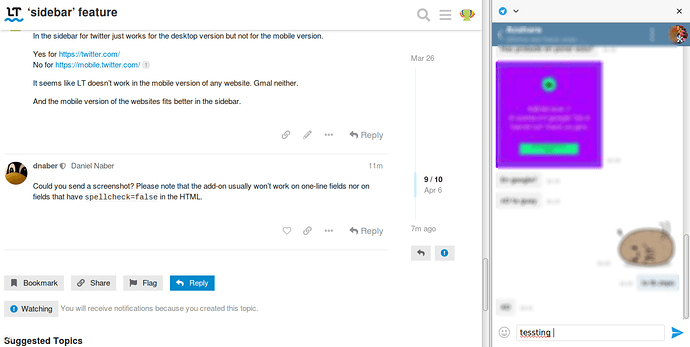 It is possible that LT works on sidebar too? Can you let us know how to test this? 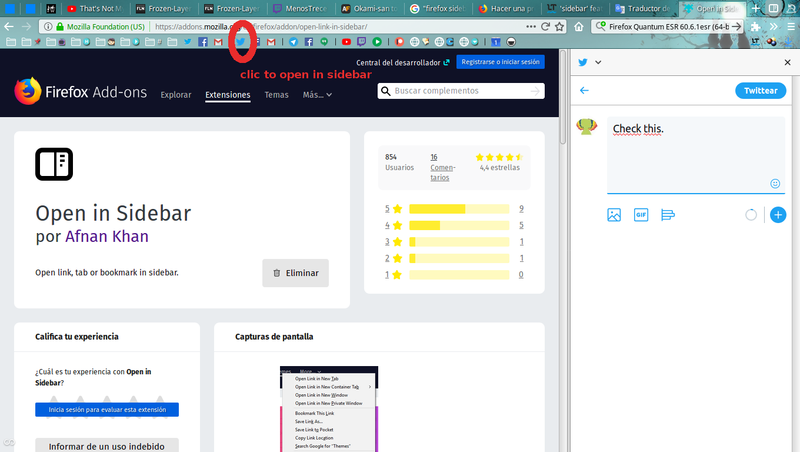 In my Firefox (67 beta), I only find history, bookmarks, and synchronized tabs? In the ESR Firefox version you can load bookmarks on sidebar checking the option on the bookmarks properties. In your version I suppose it should be using the Open In Sidebar add-on https://addons.mozilla.org/es/firefox/addon/open-link-in-sidebar/ that people that want to continue using sidebar for browsing without installing the ESR version is using. You can find different Firefox add-ons for load websites in the sidebar that loads their site mobile version. I was just told this should work with the upcoming release (2.1.8), to be released in 1-2 weeks. Perfect. I’ll wait for it. Forgot to mention that version 2.1.8 has already been released a few days ago. Did they fix the sidebar integration? Using telegram in the sidebar doesn’t show LT working. I have only tried twitter, and that works for me. Could you try twitter, too? In the sidebar for twitter just works for the desktop version but not for the mobile version. It seems like LT doesn’t work in the mobile version of any website. Gmal neither. And the mobile version of the websites fits better in the sidebar. Could you send a screenshot? 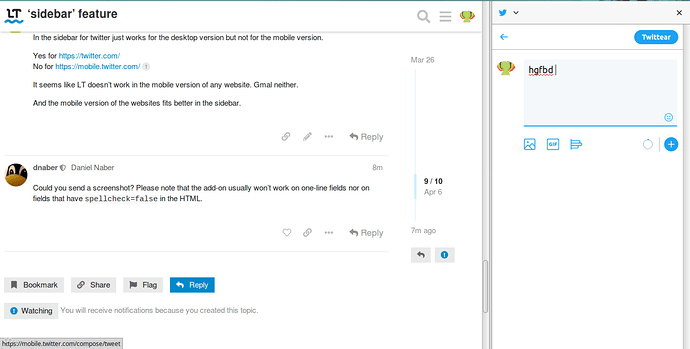 Please note that the add-on usually won’t work on one-line fields nor on fields that have spellcheck=false in the HTML. These images are from this twitter and telegram websites. 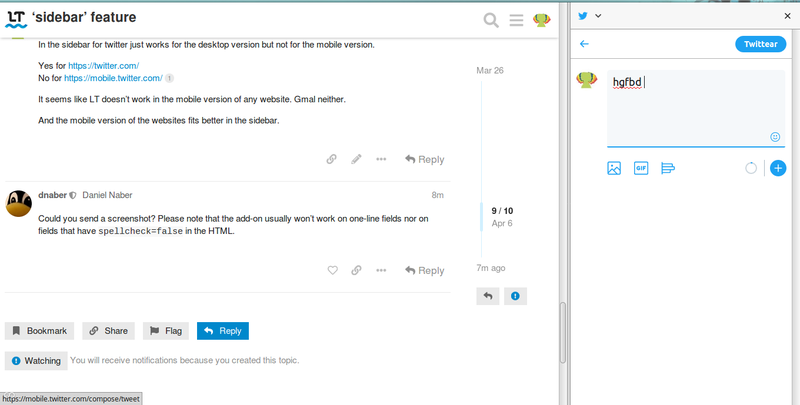 I can reproduce the issue, but our developer can’t. As this is a very specific problem and not many users have asked for this, I’m not sure we can spend more time fixing it. Anyway I did my best.